Join us in March for the first AfL Practical of the year! The Guildhall Library is the premier library for London’s history, and in conjunction with London Metropolitan Archives holds a spectacular collection of trade directories, from 1677 to the 1990s.This workshop led by AfL Board member Jane Insley is intended for individuals who may not have come across directories before, to give an idea of the kinds of information they contain, and the various means of access to that information. 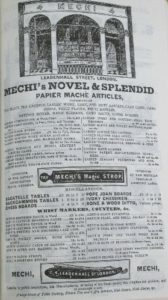 A selection of print London directories covering dates across the range will be available for individual inspection, along with access to on-line versions through Ancestry, and an example of microfilm versions (which may be the more normal format available to individual researchers). The directories were never intended to last more than a few months, so careful archive handling is required. Exactly which volumes will be available on the day will depend on their condition. There are up to 20 places on the workshop. AfL Practicals are events designed to be open and applicable to both archive practitioners and archive users. The Guildhall Library does not have refreshment facilities, but there is scope for short breaks.